Update: Twitterfeed shut down on October 31st. Try IFTTT as a free alternative tool with similar functionality. Are you looking for a free tool that aggregates an RSS feed to your Twitter account? TwitterFeed (free) scans RSS feeds for new content and posts it automatically. You can even add a prefix and suffix to the Tweet, such as hashtags or @mentions. Included are basic analytics included with TwitterFeed so you can see how many clicks each RSS item received. It works best for highly relevant, super targeted niche content. You could also consider your timeline as your own RSS reader for your own consumption. In the example below, I have been aggregating a custom XML feed I set up on a local website about a new train station being built for the town I live in. As you can see in the screenshot above, the articles have had as many as 64 clicks, which is 64 social media referrals to the website. I built the followers by searching Twitter for the keyword “Ilkeston” in Tweets and profiles with the intention of getting a follow back. My favourite way to use Twitterfeed is to automatically post interesting news stories that the followers will be interested in. This player has spent time at Manchester United and there was a lot of interest in him so I built a micro site for the individual and set up a Twitter profile. I followed thousands of Manchester United fans and got a follow back. TwitterFeed is set up to pull in specific keywords using Google Alerts. These links are obviously sending traffic to other websites, but the news stories get shared and the Twitter profile I created for the player got more follows as a result. It’s useful if there is a particular feed of content you are confident about publishing to your Twitter timeline, you can also do that. Example: I’m a fan of pretty much everything Social Media Examiner publishes, but I like their podcasts best. I found the RSS feeds for the podcasts and set these up in TwitterFeed, using appropriate hashtags to extend its reach inside Twitter once published. Anything you aggregate really needs to be super relevant to your audience, otherwise you’ll just be adding to the general noise of Twitter. To set up a new feed you click Create New Feed in the top right corner of the dashboard. 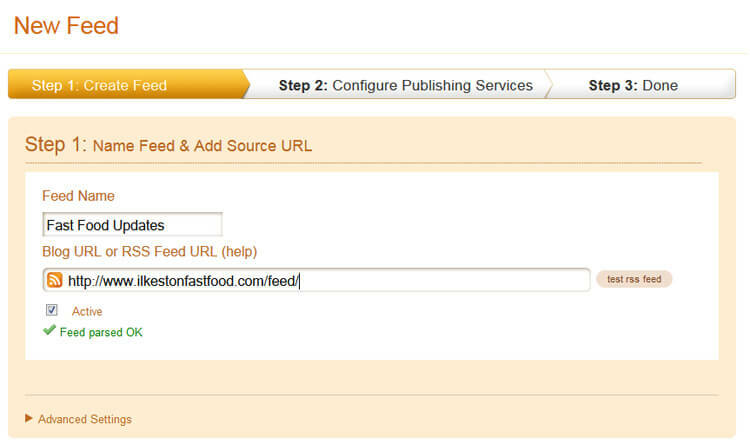 It is then a case of creating or constructing a valid RSS feed which you can paste into the feed builder. If you want to get extra creative and take content curation to the next level, consider using Sniply to add a speech bubble style floating message on the page of the content you are sharing. The part that interests me the most is the Advanced Settings. Click this and an entire menu of juicy options is revealed. Okay, now let’s break it down into sections and go through each part. The first part of these settings lets you choose how often Twitter feed should refresh the feed and fetch new updates. There’s an option to display the RSS item as title, title and description or description only. A link shortening drop down menu is provided if you want to configure that. Below this are a couple of options for posting to LinkedIn and Facebook but I have those turned off. If you have any reason to send your updates to either of these social networks, this is where you set that up. Pay particular attention to the Post Sorting options. By default you’ll see something called pubDate and this tells TwitterFeed when an item was added to the RSS feed. The other option is GUID but we don’t usually need to use that if we’re aggregating a valid feed with proper times/dates for each item. I ran into some issues with YouTube RSS feeds and I’m 100% certain YouTube feeds have a bug in them, meaning TwitterFeed is likely to repost the same videos over and over again. 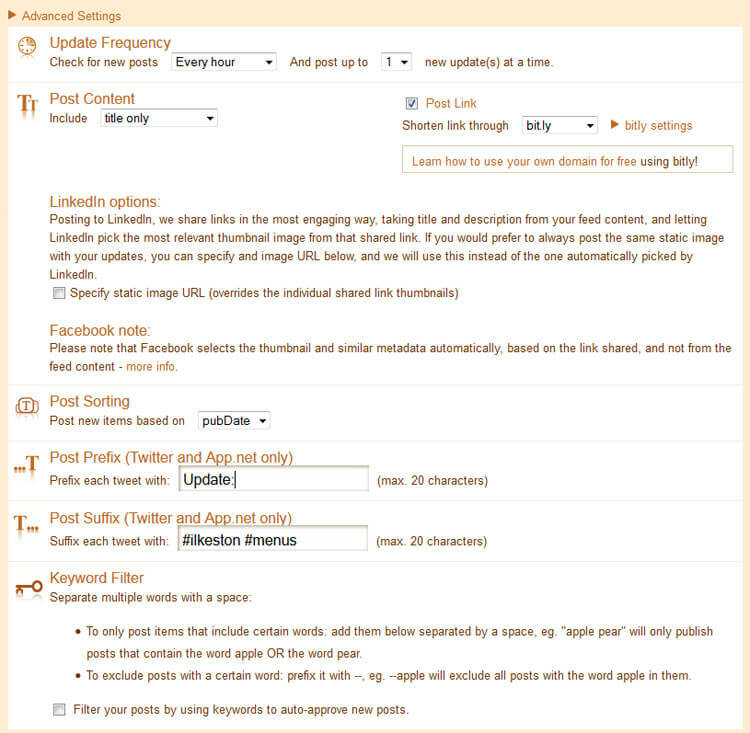 I found a solution for this which you can read about in this post about setting up common RSS feeds for social media. Mostly, you can leave it as the default pubDate. My favourite part of the Advanced Settings is the Post Prefix and Post Suffix. This is where you may add fixed pieces of text in the Tweet. Your RSS item will be sandwiched between the prefix and suffix when it is is published. I use Twitter hashtags or Twitter @ mentions but I’m always mindful of the 140 character limit in a Tweet. You don’t want the title of the RSS item to end up truncated do you? No. It might be a good idea to look at the average title length of items in the RSS feed you’re aggregating and consider how a prefix or suffix will impact your tweet character count. Finally, there is a keyword filter for distilling the RSS feed. I haven’t used this myself because I’ve always been happy with the items being published to my Twitter timelines. You might want to only post items from a particular category of a website and therefore include a keyword related to that subject. Another way to use TwitterFeed is in combination with Sniply. TwitterFeed provides the hashtags or @mentions and the custom overlay message is provided by Sniply. Discover how to automatically post content to your Twitter timeline using Sniply and TwitterFeed. The only drawback with Sniply is that is takes away Twitter cards and means your post lacks the rich data that often attracts more clickthroughs. Used wisely, TwitterFeed is devilishly useful. Employ it with finesse, because it is possible to post way too much content to Twitter and people will know you’re only auto posting. The tweets that always get the most engagement are ones in which I add a short comment of my own before sending it to my timeline. This isn’t really possible with TwitterFeed because you have a preset template. 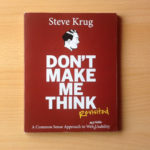 With any social media, you cannot automate everything and then not show up to interact. Set and forget is part of a strategy, not a substitute. While I like the tool, it is SO slow at times. This weekend I was setting up RSS feeds for each category of my website, and it took over an hour to set these up. I nearly died of old age waiting for the TwitterFeed site to load and save each feed. I thought I’d hit a limit to I tweeted the company and asked them what the maximum limit was. They tell me it’s 250.